A still from the purported jihadi video being used as evidence against the three men. Askhat Sharbat stood up in a Kazakh court earlier this month and admitted to a litany of grave offenses. He allowed his rented apartment to be used as an improvised studio for a video propagandizing terrorism. And then, last November, he distributed this footage through a popular messaging app. Sharbat even agreed he had expressed support for a political organization now banned by the government for purported extremism. But Sharbat was not in the dock. He was a witness for the prosecution in the trial of three men accused of hatching a violent plot to overthrow 78-year-old President Nursultan Nazarbayev. Sharbat’s testimony, given in an Almaty court over several days this month, elicited howls of protest from the dock on November 8. 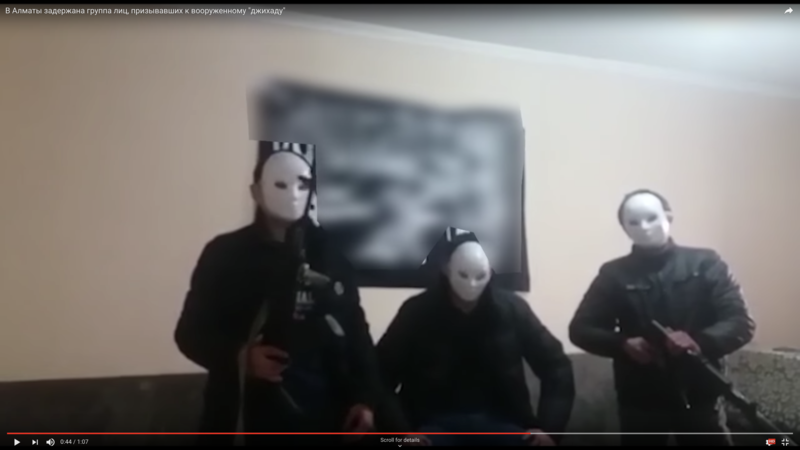 The men on trial, Almat Zhumagulov, Kenzhebek Abishev and Oralbek Omyrov, deny the charges of propagandizing terrorism, which rest heavily on the footage distributed by Sharbat. What they cannot understand – and protested about in court – is why they, and not their accuser, are on trial. Rights activists and commentators watching this peculiar case detect a familiar story of political repression and score-settling. It is not religious extremism that mostly appears to unnerve Kazakhstan’s government, but dissent. The main item of evidence presented by the prosecution has been widely disseminated and credulously reported by local media. It looks almost like a parody. The footage shows three men in white face masks standing in front of a black flag bearing a resemblance to the Islamic State standard. One figure uncertainly reads out a script, urging violent jihad against Kazakhstan. He is flanked by a pair holding fake AK-47 rifles. The case of the prosecution is not that the people in the footage are Zhumagulov, Abishev and Omyrov. Those individuals have never been identified. The narrative being weaved by the prosecution is far more convoluted. The trio now on trial say they barely knew one another when they were arrested. The one thing they did have in common, however, was involvement in an informal political discussion group called Alash. The group would gather in Almaty’s Mahatma Gandhi Park and discuss, among other things, their unhappiness with Nazarbayev’s rule. It was hardly underground plotting though. The meetings were broadcast live on Facebook. The only defendant with a demonstrable link to the would-be jihadi video is Omyrov. In one cutaway sequence also released to the media, he is shown appearing to give stage directions to the masked men. This has raised questions about Omyrov’s precise role in the drama. The other defendants’ supporters say they knew him only slightly – in Zhumagulov’s case – or not at all – in Abishev’s. They have even suggested he may have been a plant tasked with infiltrating their group. To link Omyrov’s walk-on part in the jihadi video to at least one of the other defendants, another piece of video evidence has been produced. 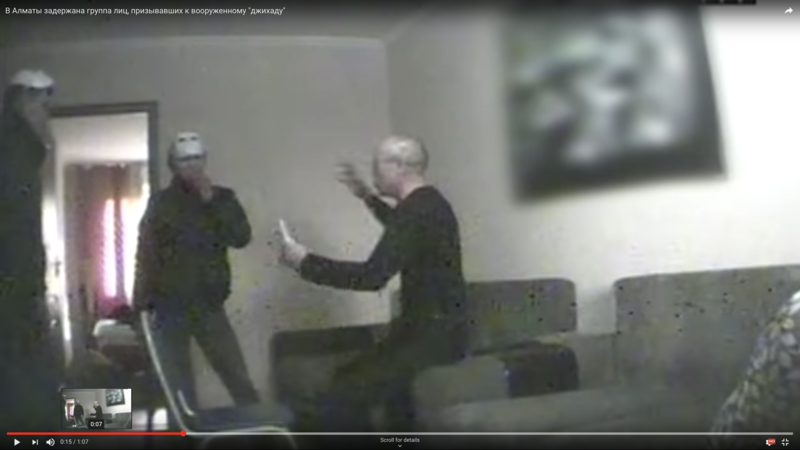 This footage is filmed in the same apartment, purportedly on the same day, but this time there is no talk of violence and revolution. The shaky mobile phone clip pans from Zhumagulov to Omyrov and a group of other men as they sit on a sofa and pledge solidarity with an opposition group called Democratic Choice of Kazakhstan, or DVK. As to Abishev, he is not even in this video. He claims never to have stepped foot in the apartment shown and that he does not have a smartphone capable of making or viewing videos. He denies ever meeting Omyrov before their arrest. To wrap him into the plot, it takes one more step. Prosecutors have presented wired conversations said to be between Zhumagulov and Abishev. In these exchanges, the pair allegedly discuss plans to set up terror cells, obtain funding and weapons and to target law enforcement officers for assault. Zhumagulov and Abishev have not acknowledged it is their voices in the recordings. It is not clear who taped the conversations and with what authority. With the chain of evidence seemingly so weak, Sharbat’s testimony feels crucial. He performed poorly on the witness stand, however, squirming under questioning from defense lawyers and defendants. He appeared to have forgotten so many basic details in his account that one exasperated attorney, Ainur Omarova, pleaded with the court to order a psychiatric assessment to determine his fitness to testify. The judge denied the motion, as well as another request to have Sharbat take a lie-detector test. Skeptics of the state’s case see this as yet another in a long list of criminal prosecutions designed to target people linked to DVK, the banned group created by exiled opposition figure and disgraced banker Mukhtar Ablyazov – a man despised by President Nazarbayev. Abishev has expressed sympathy for some of Ablyazov’s ideas, but his dalliance with politics has been expressed primarily through symbolism-heavy poetry. His work has included an allegorical piece containing a Jungle Book-like cast of characters that describes the demise of a personality cult devoted to a lion presumed to be an allusion to Nazarbayev. The authorities deny they pursue politically motivated prosecutions. Rights campaigners aren’t buying it. In his testimony to the court, Ryspek Sarsenbay, an opposition activist who has attended Alash discussions, also identified politics as the impetus for the trial. “These guys have become sacrifices in the never-ending battle between the president and the fugitive banker, even though they have nothing to do with Ablyazov and even though they haven’t taken any money from him and haven’t carried out any orders from him,” he told the court. A report published on November 5 by the Poland-based Open Dialogue Foundation bolsters accusations that Kazakhstan is waging war on dissidents. Between March and October, the report found, over 30 people were targeted with legal measures for posting criticism on social media. Confirming this picture involves just a short walk for the few reporters following the case of Zhumagulov, Abishev and Omyrov. In the very same court building, just down the corridor, another man, Aset Abishev – no relation to Kenzhebek Abishev – is on trial on charges of being a member and financial supporter of DVK. In that courtroom, prosecutors are making little secret of where the problem lies.